LAMMPS is a classical molecular dynamics code, and an acronym for Large-scale Atomic/Molecular Massively Parallel Simulator. It runs on a variety of different computer systems, including single processor systems, distributed-memory machines with MPI, and GPU and Xeon Phi systems. LAMMPS is open source software, released under the GNU General Public License. Plimpton S. Fast Parallel Algorithms for Short-Range Molecular Dynamics. J Comp Phys, 117, 1-19 (1995). where [ver] is the version of choice. Currently, versions 30Jul16 and 31Mar17 are installed. LAMMPS is a parallel, computationally intensive program. It is therefore not permitted to be used on Helix. NOTE 1: You will need to adjust this script to meet your own needs. This script is set to run on the multinode partition using 64 cores (4 nodes, each of which have 16 cores or 128 CPUs - however, LAMMPS, being floating-point operation heavy, does not make use of the second CPU on a core, therefore, we use --ntasks-per-core=1). You should benchmark your own system to find an optimal number of nodes to run on. NOTE 2: LAMMPS will also run on the "norm" partition, if you do not need to use more than a single node (16 cores = 32 CPUs). However, the version currently compiled will not run on the b1 nodes. Note 3: We do not currently have a GPU-enabled version of LAMMPS available. Please contact staff@hpc.nih.gov if you are interested in using LAMMPS on GPUs, and we can install the GPU-enabled version. A sample LAMMPS input file is given below, for a system with a solvated GroEL chaperonin protein. This input file instructs LAMMPS to run 10,000 steps of molecular dynamics on the system using the CHARMM force field. Note that the exact force field parameters are generated from the CHARMM force field parameter files using the charmm2lammps utility, which is described further below. These lines indicate that there are 3 kinds of nodes in the multinode partition. You should submit your job exclusively to one kind of node by specifying --constraint=x2695, --constraint=x2650, or --constrant=x2680 as in the examples below. LAMMPS has a utility that can be used to convert CHARMM PSF and coordinate (or PDB) files to input suitable for LAMMPS itself. These tools are in /usr/local/apps/lammps/30Jul16/tools/ch2lmp (there is also an amber2lmp directory that contains tools for converting AMBER input). Below, I give an example of converting a system. all27_prot_na is the exact version of the force field this system uses. The converter script will read the force field files from the current working directory. Please see the NIH HPC documentation on CHARMM for further information and instructions on obtaining parameter files. The second argument (groel) is the base name of the protein structure file (PSF) that the conversion utility will read in (in this case, groel.psf). There must also be a matching coordinate file (groel.crd or groel.pdb). The utility will create files groel.in and groel.data that can be used to launch a LAMMPS job. However, YOU are responsible for checking the simulation parameters and making sure that they are what you intend. Two benchmark systems were run - a Rhodopsin protein in a lipid bilayer (32,000 atoms total) using the NPT statistical ensemble and a GroEL chaperonin in explicit water (~ 468,000 atoms total). 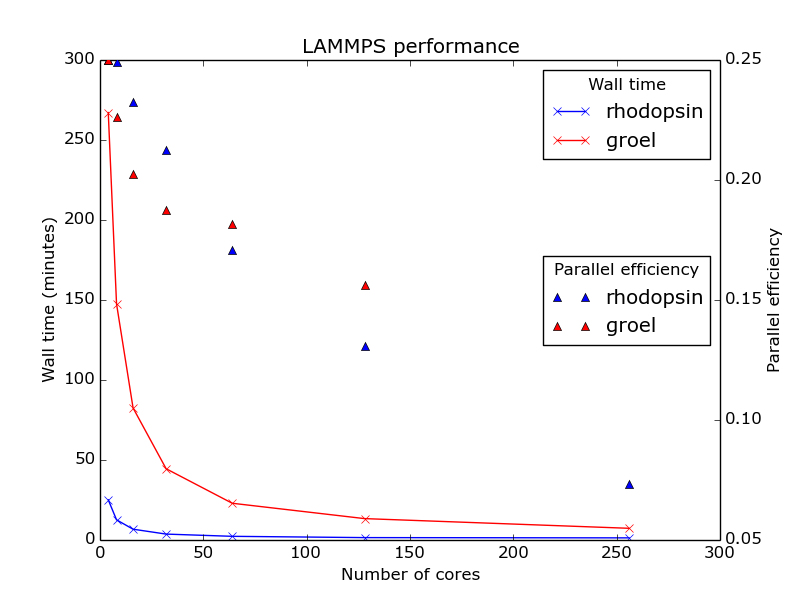 The Rhodopsin system was taken from the included LAMMPS benchmarks (/usr/local/apps/lammps/30Jul16/bench), while the GroEL was generated from existing CHARMM input files using charmm2lammps - described above. Note that the Rhodopsin benchmark was run with 2 femtosecond time steps and GroEL was run with 1 femtosecond time steps. The benchmarks were run on Biowulf InfiniBand nodes. The timings given below are for 10,000 molecular dynamics steps of each system, running on 4-256 cores.